Atomo Diagnostics, based in Sydney’s inner west, is a leading medtech company that exports rapid-test products to Africa for both professional use and self-testing. The kits are a vital diagnostic tool, particularly in countries with high human immunodeficiency virus (HIV) rates. In 2015 Atomo won the Premier’s Export Award for Innovation in Export. It is also part of the NSW Medical Technology Collaborative Export Cluster, a body coordinated by the NSW Government to discuss policy issues impacting the sector. George Sidis of IDE Group is on Atomo’s board and was part of an Austrade medtech delegation to the United States in February 2016, which was led by NSW Minister for Trade, Tourism and Major Events Stuart Ayres. The medical device company makes testing for infectious and chronic diseases safe, accurate and accessible. Working directly with healthcare workers, consumers and industry partners, Atomo creates specialist medical devices that are easy to use, reliable and also deliver rapid results. Atomo is currently exporting its rapid-test products – AtomoRapid HIV and AtomoRapid Malaria – to Africa where the company works with private sector clients, leading NGOs and public health agencies to ensure its products can be used in places with limited resources where these diseases are the greatest burden. 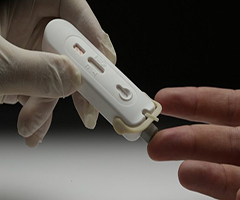 The tests can be bought from retailers or online, and can tell an individual within 15 minutes whether they are HIV positive. They are popular with people reluctant to be tested in clinics such as marginalised groups or those from small villages. CEO John Kelly says that given the size of the Australian market, export-led growth is critical to Atomo’s success. The company has just started exporting its technology to Europe where other diagnostic companies are using the kits to upgrade their own product offerings.